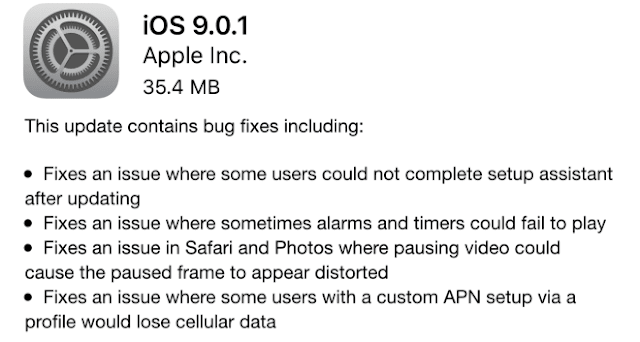 Apple has released iOS 9.0.1 to the public. This update is purely for bug fixes and addresses issues that some users have seen in iOS 9. Notable among these are issues where users could not complete the setup assistant after updating. Also fixed are issues regarding alarms and timers, viewing video in Safari and Photos, and occurrences when users with a custom APN setup would lose cellular data. As this is a bug fix release, all iOS 9 users should download this right away. Also available today, but only to developers, is another beta of iOS 9.1 with adds further performance improvements and new emoji options.